Posted December 14, 2015 by Heather Michet & filed under Food, Food As Medicine, Health Tips, Recipes. It’s easy to get low on iron if you’re not eating a significant amount of iron-rich foods such as pasture-raised beef and poultry. Taking iron tablets to supplement low iron levels usually feels like you’ve swallowed rocks: they hit your stomach and clog up the elimination system for days. 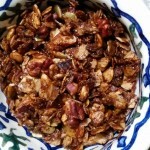 This yummy nut and seed mix is simple and easy to prepare and eat. One recipe (enough for one day’s serving) provides 25 mg. of iron! It is mixed with a small amount of fruit juice to help the body assimilate the iron: when iron is accompanied by vitamin C, the body seems to accept the mineral more readily. Pan roast all of the above in cast iron or other heavy skillet over medium low heat. Stir often to avoid scorching. Remove from heat once nuts become fragrant. Put into small bowl. Allow mixture to cool slightly. Stir in 1 Tbsp. blackstrap molasses and 1-2 Tbsp. fruit juice, such as orange juice. Eat throughout the day by the spoonful. This is great stirred into plain, unsweetened yogurt. Add some diced apple for extra crunch and vitamin C.
Munch and crunch your way to increased energy and healthier blood – no rocks! It sounds delicious. Will try to have mum eat this to help her!!! Thanks for sharing the recipe with your mom! It is indeed delicious and holds great healing value. That looks really good. Is it one day’s serving? Yes it is, Christina. I don’t take this every day myself, but I don’t think it would be harmful to do so either! Thank you for commenting. Happy munching.